The triceps brachii has three heads that connect the humerus and scapula to the forearm bone called the ulna. These heads are known as the Lateral, Medial, and Long heads. The lateral head is located on the outward facing side of the humerus. This head is most responsible for the horseshoe shape of the triceps. The long head runs along the bottom side of the humerus and is the largest of the three heads. 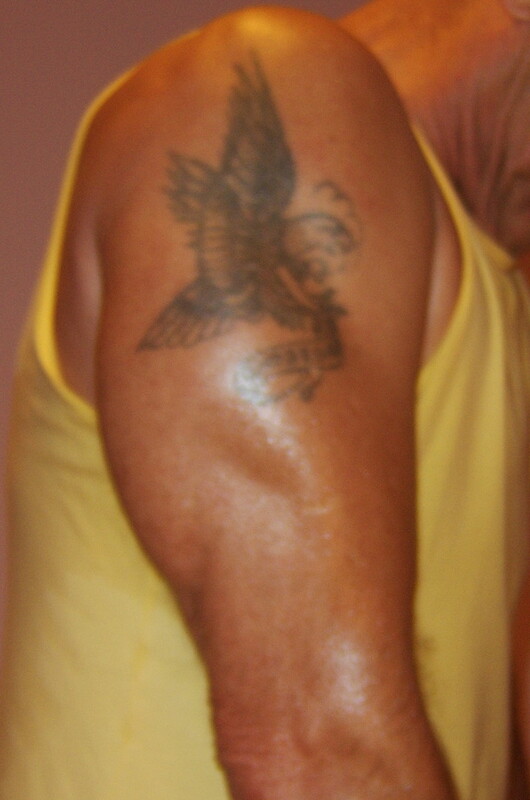 Again I will mention that your triceps make up about 70% of the total muscle mass of your upper arm. The primary function of the triceps is to extend the elbow, which results in straightening the arm. The secondary function of the triceps is fulfilled only by the long head of the muscle, which is to adduct the arm (or to bring the arm down towards the body). The triceps shares this function with the latissimus dorsi (back muscles). A number of criteria went in to selecting the best triceps exercises. I focused on compound exercises over isolation. We also want to be able to go as heavy as possible in order to build the size and strength we are seeking. Work a couple of these exercises into your weekly training, and you will see a huge improvement in your triceps within 2 months. Until I get my video camera set up, you can enjoy the following videos from YouTube. Close grip bench is probably the best triceps exercise on the planet. This exercise allows you to go heavy and put maximum stress on the one muscle besides the pecs that can help increase your bench. You want to set up like a regular bench press, but position your hands no wider than shoulder width. On the descent, you want to keep your elbows in; do not let your elbows drift away from your body like you would with a regular bench press. At the bottom of the movement, you want the bar to come to the lower portion of your chest; at the top of the movement, the bar should be over your upper chest. Ideally, your forearms should be perpendicular to the floor at all times. Your hands and wrists should be directly over your elbows throughout the movement. Scott Herman’s video below, used a slightly wider grip than I prefer, but not by much – 1-2 inches per side at most. The rest of his form is great though. He doesn’t quite touch and go like I do, preferring to stop about an inch above the rib cage, but touch and go isn’t for everyone anyways. A classic triceps builder. Keep your body as upright as possible to put the stress on your triceps rather than your chest. Use a belt with a chain to add weight to your body if you can do more than 5 reps at bodyweight. Be careful to always respect the flexibility and stability of your shoulders. Be sure not to lower your body so far that your shoulders become compromised, and always use strict form and a bounce-free concentric movement. Elbows should stop just short of lock-out at the top. Never lockout your joints with a heavy load. True powerlifting exercises, these two can be used interchangeably but only choose to use one of these exercises in any given workout. For the most part they train the same muscles. The goal here is to train the top portion of the bench press, where triceps rain supreme. I prefer rack lockouts because if I do use too much weight I can just rack the bar, and I don’t have to worry about carrying around a bunch of boards nailed together as if I didn’t already carry enough equipment around in my gym bag. However, most powerlifters that I have ever known prefer the board press to rack lockouts. I believe this is because the board press is identical to a regular bench press, except that the range of motion is much shorter (and there’s a big board on your chest). You can also vary the thickness of the boards from 1 inch to 10 inches or whatever you need for your workout. This is as close as I’ll get to recommending a triceps extension type exercise. The reason I like this exercise so much is that you really can work up to a decent weight, and it works your triceps from a different angle than any of the pressing movements. I suggest using an EZ curl bar and positioning your hands shoulder width apart. Lower the bar under control down to your nose, your hairline, or behind your head. If you feel any pain in your triceps, opt to lower the bar behind your head. Scott Herman takes it one step further in the video below and actually hangs his head off the bench. I see how this could cause neck strain in some folks, so you may just want to keep your head on the bench instead, but still drop the weight behind. What? How did this get in here? No seriously, if you can bang out a set of 10 diamond push ups that’s great, but can you clap after each rep. This is an exercise that will really condition your triceps to contract with maximum force. You want to position your hands underneath your chest with index fingers and thumb tips touching. The space between should form a diamond. As soon as you can do 10 of these without the clap, add the clap. In order to clap properly you will need to push yourself up high enough to execute the clap and return your hands to their proper diamond position for the next rep. If this is too hard you can work up to it by placing plates or books beside your hands, and ‘jump’ up onto them. This is initially a shorter range of motion than a clap. In the following video Scott Herman is just doing regular diamond push ups without a clap, that should be enough for most people. We do these in thai kickboxing class. If you use a 3-day full body training split, you can probably choose 3 of these exercises, using 1 each day. If you have an ‘arm day’ (which is a totally bogus topic for another day), you can probably choose 2 of these exercise for your triceps routine. Keep reps under 5 per set, and do no more than 3-5 sets of each exercise including warm-ups. Dedicate yourself to triceps specialization for a minimum of 2 months and you will rep wondrous rewards. This entry was posted under Best Exercises, Bodybuilding, Weight Training. You can follow any responses to this entry through the RSS 2.0 feed. You can leave a response, or trackback from your own site. some of it is all in genetics. Your body will natural distribute muscle on all 3 heads as you can never fully isolate one head because they all work together. Make sure you lock your arm all the way out when doing tricep exercises without completly stifening it and dont let your arms flail out. I would suggest investing some time into triceps extensions, specifically of the skullcrusher variety. Keep your elbows in. My wrists are in bad shape currently so I cannot do barbell arm workouts very easily, even with EZ bar :(. I found that you can use dumbells for skullcrusher on a decline bench to relieve the stress. The cable/rope extensions of the overhead and pulldown variety for tri’s are great too if you have bad wrists. I found some of these “experts” very amusing. From what I have watched my husband do (who has trained himself) some of these guys should be embarrassed to be sporting their lifts. I think if you put time and effort in at the gym you should be proud of yourself. It takes dedication. Now if your one of those people that talks trash on others because your stronger you need to go f*&^ yourself and maybe grow up mentally. There’s always going to be someone stronger or better. I’m sure there is someone out there that could put your husbands lifts to shame. Dr. Greenthumb: I used to suffer from wrist tendonitis in both wrists when I was a teenager. Once I started lifting it all went away. Now I suffer a bit from triceps tendonitis on exercises like skullcrushers when I work triceps too often. To alleviate the pain I just alter the movements, for instance dropping the weight down behind my head instead of touching my forehead. one thing that could solve that problem is to remember one should go lighter on extensions exercises and heavy on pushing exercises. heavy weights on skull crushers gave me killer elbow pain after a while – I reduced the weight and added reps and it went away. MF: Great feedback, thanks! Push ups can be an awesome exercise if you know how to modify them for increased gains. People make a mistake when they think they can do hundreds of regular push ups to make huge gains. You have to mix it up and add in force development to really continue to get stronger, break plateaus, and add muscle mass. Sam: I do appreciate your feedback, but I disagree with your reasoning. A ‘killer burn’ has never been a goal of mine for lifting. Instead I tend to focus on strength, size, performance, or some such specific goal. A ‘killer burn’ might help you rip up your tris a bit pre-contest if you are a bodybuilder, but otherwise it doesn’t have a place in most training programs. A ‘killer burn’ might actually be counter productive as that type of lifting usually stimulates DOMS, which precludes you from training your tris with more frequency. Wow… jm press… that brings back memories. We used to do those in college. Great comments, thanks! hi ppl…in order to put on more size and weight would u recommend doing a 5X5 routine and lifitng heavier? No matter what i eat i cant put on any weight…Also any good supplements out there that anyone would recommend? to put on more weight, a 5×5 routine and lifting heavier are great ideas, but more importantly, I would eat more calories. Especially more protein, complex carbs, and healthy fats. hello why don’t you try usn muscle fuel sts its for the hard gainer also if you buy it its only for milk not water also try maximuscle progain extreme that’s for water but its not as good as usn . upright rows with an ez bar then shrugs with dumbbells. Any chance of you putting together your top 5 lower back excercises. While I do quite a bit of core work including 2 minute super planks on raised dumbbells I would like to get your thoughts. It seems I do not have a long head tricep visible even with full contraction on my left arm (right arm ok); is it possible that my medial and lateral head is taking over in my left arm or could the tricep long head be atrophied in anyway over the years? How do you target long head specifically with one arm exercises. I thought behind the head dumbell skull crushers would have made the list. I find I get the best burn and full range of tricep motion with this exercise. Apart from that, this is a nice list and video demonstration of good exercises. It’s funny how many beginners only focus on biceps not knowing how important your tris are. No doubt Tyler. Thanks for the feedback. Overhead dumbbell extensions are pretty good, but I would not rate it as a top 5 exercise. I find that it is difficult to use heavy weight and keep good form on this exercise. Often when you go heavier for this, you end up flaring your elbows out to the side rather than keeping them tucked in. That’s OK, but it is exercise is maybe a top 10 triceps exercise rather than top 5. Hi Steve what is the best exercise to add mass to the medial head of the tricep ( the muscle below the long head ) I have no problems with the long head and biceps are fine. My main aim is to make my arms bigger when not tensing so i need to hit specific points. Any suggestions ? Try skullcrushers and close grip bench presses. Or perhaps the lateral head is better to focus on ( If ive read my magz correctly ) the lateral head is inside the arm and does not show on the outside. So any hard hitting exercises for that muscle ? The lateral head IS on the outside. It is the smaller muscle you see on the top of the triceps. Timmy: do all 5 in one day if you want but it’s probably overkill. If you do that, you best only train your triceps once a week, and never before chest day. I’m glad you like my workout routines. You really gained 60 pounds on your squat in 5 weeks? Congratulations buddy! I am 54 years old and have been working out for about a year and a half now. Although I have lost about 40lbs. I can’t seem to gain any size to my bi’s or tri’s. I have been employing your 5 best for some time now and also include overhead extensions. What else is there,am I to old or what? I have read that muscle development is 80% heredity is this true? I could use some help big guy. Donald: I wouldn’t say muscle development is 80% heredity. I would say it’s 60% diet, 25% training, 10% genetics, and 5% lifestyle. Losing bodyfat is more like 80% diet, 10% training, 5% genetics, and 5% lifestyle. You are not too old to gain muscle, but you have to eat and train correctly. Don’t focus on your bis and tris too much with isolation exercises. You need to also work your chest hard to see great tricep development, and you need to work your back hard to see great bicep development. I usually work chest and triceps on the same day. For now, my chest routine is bench press, incline dumbbell press, chest dips and cable X-over or flies, followed by 2-3 triceps exercises. Considering my two press exercises, do you think its too much to do close grip bp during the same workout? Also, what do you think of doing chest & triceps during the same workout? Long head only is maximally activated only with an overhead extension. None of the above exercises does that. Steve, how do you concentrate on the horseshoe (triceps) and baseball (biceps)? Brian: The three heads of the triceps make up the horseshoe. Do your 5 best triceps exercises, train your chest heavy once a week, and the horseshoe will grow. The same goes for biceps, but you gotta train your back heavy once a week. Steve, do you know if “Neutral grip dumbell press, palms facing together” is the dumbell variation of the close grip bench press, will it give the same results if you use the same weight comparison e.g 20kg close grip bench = 10kg dumbells. Toby: “Neutral grip dumbbell press, palms facing together” is not the dumbbell variation of the close grip bench press. There really is no dumbbell variation of the close grip bench press. When you execute a close grip bench press, you want to activate the triceps by thinking about breaking the bar in half. Seriously. Since dumbbells are not connected, there really is no way to break the bar in half and the triceps do not get properly activated. The best way I have found to train the triceps with dumbbells from a lying-bench-press position is to do something we used to call cross eyes. Start laying on the bench, holding dumbbells with your arms full extended above your head. Now, bending only at the elbows, lower the dumbbells down to your chest as if you were going to pour water on your face from a pitcher in each hand. The flat inside end of each dumbbell should touch your chest at the bottom position. They are called cross eyes because if you stare the dumbbells in and down to the bottom position, it will make your eyes cross. Finally, you will explosively lift the dumbbells up and out in a triceps extension type movement. The ending position is with your arms fully extended like the top position in the dumbbell bench press. This is specifically a triceps exercise. You can go heavy with this… I’ve done these with 65 lb dumbbells before. Cheers steve ive been indire need for new extension type exercises for the triceps to target different heads from when heavy weight dipping. I really do feel like im bugging you with all the constant posts in each article but im still learning i suppose. http://lorraine.typepad.co.uk/photos/uncategorized/2008/07/31/day953_2.jpg In that link there is an image of an upper arm. Please correct me if im wrong because im not sure about my tricep heads anyway – At the bottom of his tatoo where the light is shining im guessing that is the long head of the tricep and the point im trying to find out is to the left of that at the end of the wing down, is that the medial head because if so I need to target that muscle because my long head is at the end of my arm. Do you know any good exercises for that part of the arm if so please tell me. I know you cant target the heads individually like you cant with abs but i know different exercises put more emphasis on individual heads than others. Thanks and extra thanks for all the posts ive been throwing at you 😉 Sorry if i sound rude in my posts im just not aswell spoken as older people. Toby: The head on the left/back of the arm in that picture is the long head. The head with the tatoo on it is the lateral head. The medial head does not ‘pop out’ at all, but it runs between the other two heads down to the elbow. Hopefully that clears things up. I have an idea…you who obviously use steroids…attribute your “strength” to the obvious, and do it naturally. I like the guys who are bloated, yet can’t lift as much as the natural-guy. Your secret…protein..yeah right. No-Steroids: I personally don’t use steroids. I have studied them, as most people who are personal trainers should do. It is important to know everything there is to know about your industry. If I sat down this second to write a steroid cycle with proper PCT, I couldn’t do it. I’d have to go back and refresh my memory on it all. I do know what Methylated pro-hormones / pro-steroids are and I know what Nolvadex is, so therefore I feel I can comment when someone posts references to those things on the blog. Protein is the most important supplement, steroids or not. Thanks for your comment. What are your thoughts on using the the perfect pushup system? I’ve started to us it lately and was wondering if I’d have better results just sticking to other heavylifting exercises, thanks. Martin: The Perfect Push Up is fun for getting in extra workouts, or for integrating push ups into a HIIT or HIRT routine. If you like the Perfect Push Up, use it. Just don’t let it interfere with your regular training, because push ups can only get you so far. Start off by saying I love the site. Also like the fact I can view the videos on my phone. Question: How come when I do pushups (3×20 or more) my pecs and triceps look and feel more “swollen” than I do after a session at the gym? Do I get a better workout from pushups than I do anything else? Or am I being a senile? Mr. S: You are senile. Everyone knows the ‘pump’ means virtually nothing. There’s a huge difference between swelling up your muscles with blood and lactic acid after doing 100 pushups, and going to the gym with a predefined purpose to train smart using scientific knowledge and expert input. You should still do push ups once in a while though, because they are fun and keep you swollen. By the way, the ‘pump’ actually does help with muscle recovery because it fills your muscles with nutrients that facilitate recovery. CLOSE GRIP ARE THE KINGS,NEXT DIPS WITH BODY UPRIGHT. TO TRY SOMETHING NEW, SUPER-SET THEM. MAJOR F’ING PAIN THE NEXT DAY ALSO TRY REV BENCH PRESS. Change your hand position or don’t do diamond push-ups. 3 x 8 is not overkill for a 3 day split. I just hope you are doing your deadlifts on back day and squats on leg day. i do Romanian dead lifts on a back day and barbell squats on a leg……. Has anyone heard of a reverse bench press? You put your hands at shoulder width apart with with a reverse grip. You MUST have a spotter, because this is EXTREMELY awkward to get of the bench. A guy with 22 in arms (naturally) recommended it. I have gained over 3 inches in a little less than 2 years. I hate the reverse bench press. It’s awkward and there’s a huge risk of injury. Use them if you want, but I’ll never recommend them. Also, the guy with 22 inch guns would probably still have 22 inch guns even if he never did a reverse bench press in his life. Man, how do you work on the medial head of one arm without the other heads taking over? Same thing with the lateral head as well. Everyone tells me that overhead does this, and close grip does that, but all postitions yield the same results. I’m hoping you can get back to me on that. The 3 heads of the triceps work together as one muscle group. It is pretty hard to isolate any one of the heads. I can tell you that the long head, the biggest head that runs from the scapula across the shoulder and down to the forearm, takes the majority of the load when the triceps are fully extended. That is why overhead triceps extensions and presses are recommended to develop big tris. Also, close grip bench is great because all 3 heads are activated and you can use a heavy load. Someone correct me if I’m wrong, but the best way to work the lateral head is probably a supinated grip triceps extension and dips. Edit: Dips are good for developing the lateral head, but the close-grip bench press, triceps kickbacks, and PROnated grip triceps extensions are best for developing the lateral head, rather than the supinated grip. Someone also mentioned rope pull downs. Ok….you’re wrong. To work the lateral head you can do any pushdowns/pulldowns where your thumbs face upwards (ropes, v bar etc), or use a closed grip on presses. Dips and supinating your grip works the medial head more. Thanks for the tip man. One more thing, what would you consider to be the best excercise for medial head development on each arm as an individual? Hey Steve are cable excersises for triceps okay to include and do they help add size? Hey Steve I have been training for the last four months after a 2 year lay-off and have been experiencing great gains but my triceps are lacking. My elbows pop and hurt when I do skull crushers, or overheads with anything more than 100 lbs and 50lb dumbbells respecitively. This has been a problem even a few years back when I was lifting Any reccomendations? Maybe your elbows can’t handle full range of motion on those exercises. Try varying shoulder and elbow angles to avoid pain. For example, I personally can’t do skullcrushers with my elbows pointing straight up; I have to hold them at a 30-40 degree angle and let the weight drop down to the top of my head rather than going to my forehead or nose. Close grip bench should be good for you. Steve last year I met a 165lb guy who can pump out 225 on bench pretty darn easy, while I was stuck struggling with 155 for sets of 3×8. So I looked at our different techniques and noticed he used a much wider grip than I did. The past few months I have been working on increasing my bench sets with a wider grip and have seen great gains, doing 3×8 of 205 yesterday. However, I have heard that to really increase your one rep max, tricep development is extremely important. Last time I maxed I was doing sets of ~175 for 3×8 and hit 250lbs ORM. I feel fairly confident that I could possibly hit 275 for a ORM currently. Do you have any advice on what tricep exercises to use to specifically target the muscles needed for a good ORM? I feel fairly confident in my chest workout schedule but know that my tricep development has been lagging behind due to a lack of knowledge of what exercises work. Thanks for all the help so far. hey i made the mistake of working out my arms for the first 4 years of working out….and i find when i bench press i feel more burn in my tris then my chest like there takin all the brute force of it…is there anyway besides flies that i can work out my chest without my tris so i can somewhat equal them out? When ever i work out i never feel a burn but i do feel resistance. so any help with my routine or healthy concerns would be much appreciated. Seems like you’re not taking any time off. You grow when you rest, not when you train. I’d take at least one day off a week, if not two. That is the worst routine I’ve ever seen… try full body workout or upper/lower body split and eat right and you’ll grow. Hope I helped 😉 Cheers! steve in how much time i ll get good triceps from these excersises?? My triceps are not bad, it’s just my biceps have started lacking. They used to be decent in terms of thickness, but they have gradually got thinner which is really bothering me and I don’t get that pump feeling anymore. I recently pinched a nerve while training jujitsu and it caused me to lose strength in tricep, now my lateral and medial heads have shrunk to almost nothing, while my long head has over-grown to compensate. What can i do to isolate the lateral head as much as possible?? Are you sure the nerve is not still pinched? You might want to consider checking with a doctor or physical therapist to make sure you are structurally back to normal. A killer burn equals DOMS? Not so sure about this. I think that is old school thinking. I can do a ton of push ups and get a killer burn and never be sore the next day. Or i could do negatives on bench, never get a burn, and be sore for a week or more after. The burn is lactic acid which goes away before the work out is done. The DOMS, is from muscle trauma.SO the lesson is,… if you are sore, do not work that muscle out,… it is still recovering. If it is burning while you work out,… probably doing more endurance or the muscle is not use to it. That is one of the dumbest comments ever. close grip presses,skull crushers,dips,reverse grip cable pulldowns=NICE TRIS. Thanks for that helpful breakdown ricky. I don’t think you’ve diversified yourself enough there, but nice job nonetheless. Triceps are easy! For the past 10 years i ‘ve been slaving away on endless tricep extensions and diamond push ups and i have yet to see my arms grow a single centimeter! But now i realize what i’ve been doing wrong. I should be doing AT LEAST 20-25 sets of triceps each workout, 3 days a week, instead of just 10 dinky sets. This article has inspired me, so i will add all of these excercises to my routine next time! Any other suggestions would be appreciated! 20-25 sets, eh? OK then. Good luck.